Video recordings of the 30 lectures given in class during the academic year 2014-15 are available in the Robotics 1 playlist of the Video DIAG - Sapienza YouTube channel. Please note that these are traditional lectures with the use of multimedia material, not prepared on purpose for an online offering (differently from MOOC courses). Aims: This course provides the basic tools for the kinematic analysis, trajectory planning, and programming of motion tasks for robot manipulators in industrial and service environments. 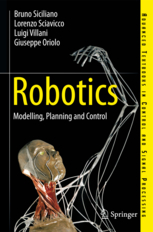 Contents: Typical robotic systems are illustrated through examples of manipulators and mobile-base robots in industrial and service applications. The basic functional components of a robot are presented: mechanics for manipulation, actuators, proprio- and exteroceptive sensing devices, control architecture, and programming. Direct, inverse, and differential kinematic models of robot manipulators are analyzed. Trajectory planning methods both in the joint and in the task (Cartesian) space are then explored. Simple control schemes are introduced, including kinematic control for robot arms and decentralized dynamic control for the single axes of a manipulator. Prerequisites: The course is self-contained and does not need special prerequisites. Still, elementary knowledge of kinematics (as given in an undergraduate Physics course) and some background in Automatic Control are useful. The course is introductory (and mandatory) for the advanced courses Robotics 2 and Autonomous and Mobile Robotics. Download the Errata Corrige for this book. Only selected chapters are part of the course program, but this book is a perfect reference also for further studies. Other course material (PDF of the lecture slides, technical papers, data sheets, videos, texts of exams (with or without solution), exercises) is available in this page (requires Acrobat Reader 7.0 or later). Please register to exams via the web site Infostud, using your student ID ("matricola") and password. Choose the course name in the list with the correct number of credits. The same procedure applies also to incoming Erasmus+ and Erasmus Mundus students. I open sessions only for the exam of Robotics I (code 1023235, 6 credits). For past versions (e.g., Robotica I (code 1027891, 6 credits), Robotics (code 1027894, 6 credits), Robotica (code 1023234, 6 credits)) and any other situation, please contact me in advance.